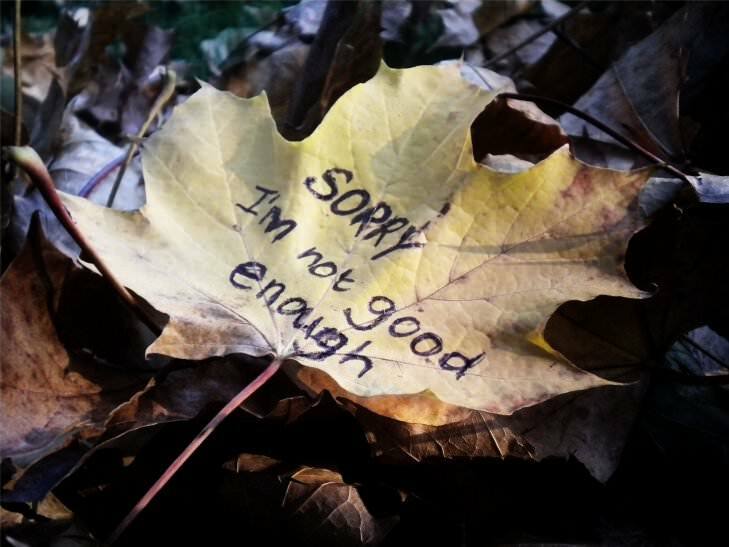 Why Do So Many On The Spiritual Path Feel They Are Not Good Enough? Everyone on this planet understands that being human involves moments of self-doubt, hesitation, and/or wondering if we are “good enough” to reach our goals and fulfill our desires. However, for “light workers” or those on the spiritual path, these feelings are often more pervasive, intense, confusing, and even paralyzing. Rather than fleeting moments of feeling unsure, our episodes appear more difficult to overcome, and almost foundational or at the core of our awakening process. As lightworkers, most of us consider ourselves to be human beings of powerfully energetic and universal fabric; connected to all on this planet and beyond; and part of a bigger picture regarding the future of our species, our planet, and the cosmos. So, why are we so hard on ourselves? Why do we tend to over-think, feel insecure, dwell in self-doubt, or get overly impatient with ourselves–even in situations where we would likely show understanding and compassion for someone else doing or thinking the exact same thing? It is true that we can point our fingers at different life events or critical people whose hurtful words and unkind actions may have nurtured our sense of uneasiness or “unworthiness.” However, a root cause that all of us in the awakening process seem to share is the feeling of “not fitting in,” no matter how good we are at faking it. Why? Unfortunately, being more “awake” on this planet still means being truly different than 99% of the population in genetic frequency, “sensitivities,” and perspectives. Even armed with this important awareness, we still yearn to be understood; to “belong” here; to feel like we are using our talents effectively; and to experience true love for another, mutually and unconditionally. These goals may sound basic, but in reality are all very “awakened” concepts that the 3D world has yet to fully revere and embrace. So, it is natural for light workers to feel isolated, discouraged, and unsure when the frequencies of our partners, family members, and friends don’t match ours; when so few people “get us” or know how to make us feel complete; and when–on top of what we already endure from our own human experiences—we have special “talents” that involve sensing the pain, pressure, and problems of the people and world around us. Esteemed leaders, respected mentors, and beloved idols whom we trust in our homes, schools, governments, religious institutions, and even the metaphysical world are still very human—and can let us down. When they tell us intentionally deceptive information, are simply misinformed, fall from grace, or do not prioritize our best interests, we second-guess ourselves. Even the most well-intentioned, educated, and/or experienced people will make mistakes or may spread disinformation. However, we often criticize OURSELVES for not predicting it or not seeing through it or for having resonated with the person or philosophy in the first place. We then lose confidence in our more “spiritual gifts,” including clarity, judgment, and discernment. In other words, we seriously doubt OUR abilities to sense the truth intuitively and to make conscious decisions. TIP: Remind yourself that intuition (like logic!) isn’t emotion. It may cause an emotional reaction once processed, but it is not emotion So, the more emotionally vested you are in a particular person or philosophy, the more clouded your intuition may be. Just because you were captivated or convinced by a person or theory that wasn’t what it seemed, doesn’t mean your radar or intuition is damaged. Due diligence is key; determine more about what you are being told, who is telling it, why, and why now. Ask yourself these questions: Does what I’m being told resonate with me because it is convenient and what I WANT to hear–rather than what I know and need to hear? Is it verifiable; can it be demonstrated? What is the proven track record of the source and how accurate have his or her predictions, information, and claims been until now? Is the message one of fear, powerlessness, and blaming other forces, or is it one of inspiration, transformation, and proactive change? Most light workers lean toward “perfectionism” in at least one or more aspects of their lives, such as health, fitness, beauty, work, parenting, the arts, relationships, organizational skills, etc. Through the light worker lens, we see details, perspectives, and possibilities that many others may not. We envision amazing outcomes for ourselves and our world, and are always frustrated when, regardless of how we may try, life isn’t perfect at all or involves harsh trade-offs. We then wonder if we are trying too hard, not trying enough, or if the problem is within ourselves because we missed something, or aren’t capable enough, or aren’t deserving enough of that “perfect picture” we believe is possible. TIP: Keep in mind that we remember in our souls how great, vast, and powerful our energies truly are when not trapped in this imperfect human form and in this very imperfect 3D world. How can we not feel frustrated, disappointed, and impatient with the limitations of human minds and bodies when we know our essence is so much more? Although the confines of our human existences make it virtually impossible to maintain a constant sense of limitlessness and perfection, there can still be great fun, meaning, and purpose in falling short of perfect. As a matter of fact, in this reality, it is the imperfections, obstacles, “accidents,” and stumbles that truly guide us on our paths, help us assist others with sincerity, and deliver us to incredible places and surprising achievements we might never have imagined otherwise. The more that we “wake up” to the world around us, the more we feel and react to the frequencies of other people, the planet, technologies, and the cosmos. Another way of describing this extraordinary gift is that we pick up, sense, and take in diverse frequencies from friends, family, co-workers, and acquaintances around us; from personal technology devices and creature comforts, as well as larger electrical grids, power plants, towers, and systems; and from the gravitational and other effects of lunar cycles, solar flares, planetary alignments, etc. As a result, some of us may experience physical symptoms such as fatigue, headaches, nausea, allergies, hormone imbalances, thyroid issues, adrenal issues, joint pain, organ failure, and on and on. Others may experience major mood swings that seem out-of-the-blue; increased anxiety and irritability; trouble focusing; extreme sadness or depression – or a combination of all of it. On top of that, we may have strange dreams, suffer from abnormal sleep patterns, sense an invisible presence, hear bizarre noises in our ears, or have other experiences that others don’t. How can we not doubt ourselves and wonder if we are sick or crazy or both? Of course, those thoughts are scary and make us feel more vulnerable, weak, confused—and even more sick, crazy, or both! TIP: For at least a couple of weeks, keep a recorded or written journal of your experiences, thoughts, emotions, and physical symptoms, as it will help you see correlations. You will better understand what you “pick up,” when, and how. Chances are there are many energetic influences each day that magnify your own feelings and ailments, or create symptoms that aren’t really “yours” at all. For more details regarding this phenomenon and specific tools to make the most of it, check out: Is What I’m Feeling All ‘Mine’? In addition to the effects of their EMF and radiation frequencies, technological devices can assault us mentally as well. No one will argue against the fact that our rapidly advancing smart phones, ipads, watches, goggles, laptops and more connect to us vast amounts of data and can make aspects of life so much easier than most of us dreamed. However, we can’t deny that technology DISCONNECTS us from the people and activities in our immediate vicinity, as well as disconnects us from heart. As light workers, we feel disconnected from most people anyway–only to have someone looking down at his or her phone while we try to have dinner together or engage in a conversation or enjoy a movie together or lock down a business deal. When others around us are distracted from our time together, we feel even more alone and unworthy of undivided attention. As if that isn’t rattling enough, our own devices have a constant stream of misinformation, as well as people’s “perfect profiles” and “marvelous moments” on social media. How can we not compare our lives to what appears to be theirs – and not feel like we are missing out or underachieving? We know that the glamorous or enviable snapshots we may see online do not depict that person’s true life and challenges. Nevertheless, seeing others feeling happy, fulfilled, and seemingly “perfect” can fan the flames of self-doubt and self-criticism. TIP: Be mindful of the amount time that technological devices infiltrate your daily routine. How many hours each day do you open yourself up to the misinformation, contradictory values, and Photoshopped images that bombard us online? It’s great to be as excited as the next person about seeing pictures of weddings we didn’t attend and cute kids we will never meet but, unfortunately, it’s often at the expense of the people who are right in front of us. Perhaps we consumers should demand technology that helps us better communicate with and connect to the humans around us – as well as fortify our own bodies and systems? What if popular technology helped us decipher the body language, tone, and personal frequencies of the people in front of us; alerted us when our bodies were deficient in nutrients or fluids; gave us information to prove or disprove another person’s argument or stance; and clued us into what the consequences of our exchange and decisions might be? Technology choices don’t need to be about making each one of us plugged into cyberspace and painfully accessible to the world 24/7 – but can be about making the time we are plugged into it much more effective. Technology needs to be about helping us make the most of our human interactions and experiences, not avoiding them. Technologies in the near future can and should help us better communicate with, understand, and relate to people in front of us; help us enjoy being active and involved humans; help educate us; and connect us to – NOT DISCONNECT us from realities at hand. More and more, people on the spiritual path are finding themselves involved in twin flame relationships, and/or deep soul connections that mimic them. It is no secret that these relationships are exceedingly difficult on the heart, mind, body, and spirit, especially in the “runner phase.” The runner phase occurs when one partner becomes overwhelmed by the power and connection of the relationship and then literally and figuratively runs form it. He or she may do anything to sabotage the relationship; distract from it; attempt to rebel against it; and take efforts to move forward without it. Although the true twin flame runner typically does not realize it, these efforts stem from his or her own fears, insecurities, and vulnerability. In response, the twin “waiting” for the runner often experiences even more discomfort ranging from anger, depression, and anxiety to devastating disappointment, confusion, and emptiness. The partner waiting for the runner is left second-guessing everything—the powerful connection he or she felt, self-worth, judgment, clarity, and the ability to fully love anyone else again. Tips for Navigating the Twin Flame Experience and Why Isn’t My Twin Flame Relationship Working? As harsh as society or other critics may seem, we know that we light workers are often worse to ourselves. Perhaps we forget that we are not here to single-handedly “save the world,” but to make a difference in our own little worlds? Light workers are not here on this planet to bury our heads in the sand or lose ourselves in perpetual bliss. We ARE here as pioneers, forging a difficult path. It is important that we allow ourselves to be joyful BUT also uncomfortable–so that we are able to identify and change the destructive ways humans treat each other and this planet. In embracing our own variety of emotions, senses, sentiments, and experiences, we better understand what it means to be human and we better use the powerful gifts that we are “remembering” along the way. Although we may feel like the “crazy ones” at family gatherings or office parties, light workers are the ones just crazy enough—and insightful and open and visionary enough—to make a difference. You are not alone in how you feel, including the conflicts and contradictions in your relationship with yourself as well as with others. Since you aren’t alone, what do you think others need to hear in order to feel better and move forward? What do you wish you were told or shown that would’ve made progress easier, now or earlier in life? What makes you laugh, smile, and feel good? What makes you feel most like you, even in this limited human form and imperfect (3D) experience? However we answer those questions for ourselves, those answers are the keys. They are the keys that enable us to trust, love, and honor ourselves much more fully, and help others do the same. We may hesitate, doubt, or second-guess ourselves every now and then, but when we pinpoint why, we are able to quickly adjust, fine-tune, and continue our important progress.